Hi! I am dreaming of one day owning a 3 stone emerald cut ring. I am wanting a moissanite or Amora Krupp’s emerald cut. My head is spinning with all the different brands that are out now! HELP! I don’t necessarily want windmills because I don’t want it to look too much like an asscher cut? But I do want the most diamond like. Hi Angel, like you I too have been on the hunt for the perfect EC moissy instead of a diamond. As frame of reference I am a big diamond lover and have owned several large diamonds. Still love diamonds but trying to find a moiss I love since it becomes harder to justify spending 6 figures on a diamond! 1) Diamond ECs have windmills extending into the center of the stone (Krupps do that). Moiss ECs (e.g. C&C) out there typically have a shorter windmill that does not extend into the center, which to me is a dead giveaway that it's a moiss. 2) In comparing moissy EC with diamond, another giveaway is the fire (i.e. colored light return). EC diamonds due to the cut and mirror like effect, tend to give off more brillance (i.e. white light return) than fire, whereas an EC moiss is a lot more firey. I think it's pretty, but obviously it doesn't really behave like a diamond under certain lighting conditions. 3) The vast majority of EC moiss I have seen lack crisp, clean lines - which I suspect is due to the nature of the cut not eliminating the birefraction (the nature of moiss is that one beam of light goes in, 2 beam of light comes out - meaning it has a slight hazy / blurry effect, which is particularly prominent in crushed ice type stones). The only one that I have seen (in photos only, not IRL) that doesn't have this issue is Schbach's moiss, but only a real life examination would confirm if this is the case. I can't comment on Krupps since I have not seen enough photos/videos to make any comparison. All in, I would say Schbach's and (maybe) Krupps so far definitely hold promise, especially if you are looking for something that's not too big - the bigger it is the easier it becomes to spot differences. hi! Thank you so much for your in depth and informative reply! I have been eyeing and obsessing over emerald cuts for a good 3 years now! Trust me if I could afford a nice size diamond emerald cut then I would just go with that but I want a 3 stone emerald cut with at least a 1-2 ct center so I would never be able to afford that. I will have to check Schubach out again. They are actually one of the first ones I reached out for pricing about. It’s just a headache because everyone claim to have the most diamond like emerald cut but it’s so hard to tell just from photos or even videos. 2 things bother me about the moissanites is the rainbow flashes vs white light flashes. And then the lack of crisp lines that a diamond has. I def can see the slight hazyness that you talked about. I wish so bad to find more photos and videos of the Amora Krupps. Anyways best of luck and if you make a decision or any new discoveries please update me! Thank so much! 3) The vast majority of EC moiss I have seen lack crisp, clean lines - which I suspect is due to the nature of the cut not eliminating the birefraction (the nature of moiss is that one beam of light goes in, 2 beam of light comes out - meaning it's more firey, but also has a slight hazy / blurry effect, which is particularly prominent in crushed ice type stones). The only one that I have seen (in photos only, not IRL) that doesn't have this issue is Schbach's moiss, but only a real life examination would confirm if this is the case. I can't comment on Krupps since I have not seen enough photos/videos to make any comparison. Good points in your post. I wanted to note a couple things though and I'll post photos to confirm. We recently sent a Charles and Colvard F1 Moissanite to the diamond grading lab and had them grade and photo so we could compare. 1 - The facets simply weren't even properly straight! I'll post a photo to show shortly, but that alone is going to create problems with how light is returned. 2 - The facet junctions were rounded, which will reduce the crispness of the fire. 3 - General comment but the center of the F1 was pretty blah. Note that the Amora Krupps does have diamond sharp facet junctions (again, photos coming) and also I want to emphasize that the Amora Gem is singly refractive in the face up view! It is only doubly refractive when viewed from the side. In other words, face up you have the expected crispness and beauty as a singly refractive gem like diamond. Next, it was time to open up the envelope enclosing the Krupps cut, my first impression was also "WOW!" but a different kind of "wow!" because, again, I saw something that I wasn't expecting. This little stone looked exactly like an emerald cut diamond! I was completely shocked at how much this beautiful gem looked like an emerald cut natural diamond. Both of my aunts have 2ct emerald cut engagement rings, one in a solitaire and one in a halo, and this Amora Gem looks exactly like the emerald cut diamond in their rings. 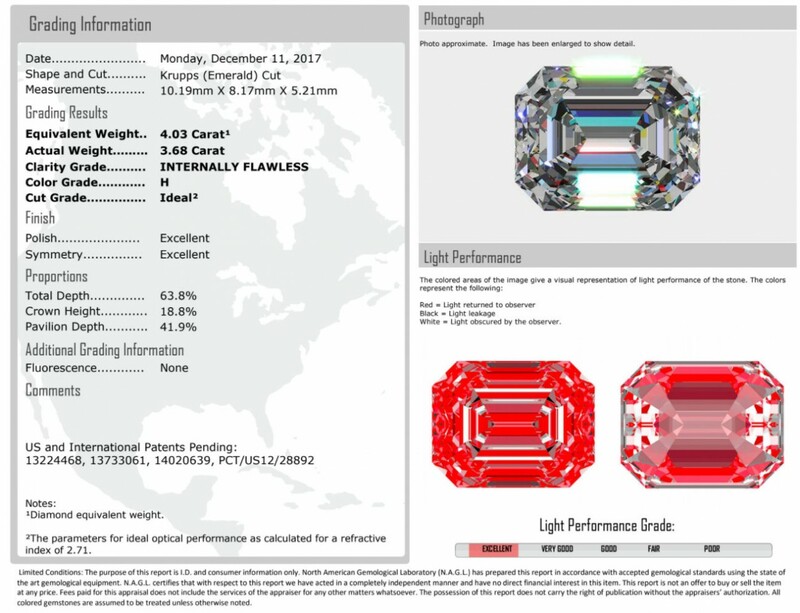 I'll post the grading lab photos of the F1 Emerald Moissanite shortly so you can see what I am referring to in terms of the facets not being straight. Less, since it's cut to be singly refractive face up, when we tilt / rock the stone from side to side, are we able to see the birefrigence? Also, you had mentioned earlier rounded facet junctions affects the crispness of fire - can you explain how that works? If you are looking at it under high magnification (10x+) then you might be able to see the double refraction at the extreme of each side tilt. The recommended way for someone to determine if Amora or diamond is to view it at a 45 degree angle, from the underside, using 10x magnification. With close review, you'll see the facet junctions appear to very slightly double in Amora but not in diamond. But - this isn't something you are going to see with your naked eye and the top down view is otherwise singly refractive and thus the same crispness. Re: rounded facets - effectively if the facet junctions are too rounded, it will cause the beams of light trying to exit there to be wrapped back into the stone. Thus, the overall fire is reduced, and at the same time the extra light bouncing around in the stone will make what is exiting appear more muted since the background of the stone itself is brighter due to the additional light bouncing around internally. We saw this firsthand b/c the initial Amora's had rounded faceting due to none of the traditional polishing materials being able to withstand polishing the Amora facets due to it's toughness. Once we figured out a proprietary alloy to use, then the fire jumped significantly due to the diamond sharp facets. Let me add the diamond facet photo from a GIA D color master diamond, to the Amora & F1 Moissanite facet edge photos and I'll show you exactly the difference. You def sound like an expert yourself and spot on regarding these differences in most EC moissanites on the market. I reached out to Schubach regarding my desperate search for the most diamond like EC. I very much liked the reply that she gave me and copied it below for you to see. I am awaiting pricing now. But I am also wanting to see more about the Amora Krupps. It sounds like either of these are indeed going to be the best options. Less, I filled out the form to get more info on the waiting list and cost of an Amora Krupps. Is this all that I need to do? Are there any post in these forums where customers have posted photos of their Amora Krupps? I have been desperately searching the net for more real life photos with not much luck. Thanks for both of your help! "There are a few things to consider with emerald cuts. The crispness, the ratio of the cut, and the cut itself. We feel our emeralds are the most diamond like on the market due to these factors. Our moissanite line in general is cut to minimize the double refraction, and this uses more material. Most vendors cut to maximize the rough material. Second, the ratio... we have cut ours to a more ideal emerald cut length to width ratio. 8x6 is not ideal in diamond. Our stone is cut to 8x5.5mm to keep in line with our ratio. And lastly, we have beautiful clipped corners and strong windmills to make the faceting incredibly realistic. We have both colourless and near colourless material available, so you can get the colour grade you prefer. I cannot comment on the other choices out there, but I know ours are stunning. Less, I filled out the form to get more info on the waiting list and cost of an Amora Krupps. Is this all that I need to do? Are there any post in these forums where customers have posted photos of their Amora Krupps? Thanks for posting the Schubachs emerald - I can say at least based on the photos, it is definitely better than the F1 Moissanite emerald! Our moissanite line in general is cut to minimize the double refraction, and this uses more material. Most vendors cut to maximize the rough material. Honestly, this doesn't make sense. You can't adjust the amount of rough used to alter the double refraction. Double refraction is intrinsic to the crystal, no matter how big or small the piece of crystal is. You cut on the proper crystal axis to put the double refraction of any SiC crystal (Moissanite, Amora, etc) on the side and ensure the top is the singly refractive plane...but you can't use more or less material to change this! (and lol). It is true many vendors cut to save rough material (ala the flat top crown so infamous on Charles and Colvard round brilliant, ahem) but that affects things like fire and brilliance and windowing, not double refraction. Anyway, Schubach's uses another firm to cut and supply them, so they are not cutting themselves and that leads to confusion in claims like this. Second, the ratio... we have cut ours to a more ideal emerald cut length to width ratio. 8x6 is not ideal in diamond. Our stone is cut to 8x5.5mm to keep in line with our ratio. So 8/5.5 = 1.45 length to width. That's on the 'skinny' side of things (note diamond ranges from 1.25 - 1.60 l:w) but the skinnier shape does not maximize light return, though the shape itself can look very nice. The closer you get to square/circular, the better you can return light since light can come from any angle (also why round is the top's for light return...it can reflect light from any incoming source, 360 degrees). You can see the light performance grade above. Anyway, thanks for posting the Schubachs' emerald - I am happy to see it is better than the F1 Moissanite. I'll post the Forever One Moissanite Emerald photos shortly and you'll get a good laugh. Well Less you are quickly convincing me that the Amora Krupps is the way to go for the most diamond like emerald cut. If only I could get my hands on one. I found a lady on instagram that waited 6 years for hers! I am willing to wait though for a better quality stone. I understand why y’all decided on the ratio that y’all did but I’m a little uncertain on how I feel about the chunkier stones since the retangular shape is what first draws me to an emerald cut. So that is something I kind of need to ponder over but as far as quality, I am pretty sold. Haha it’s good to know Schubach’s line is better than C&C brand. I actually had a forever 1 EC that I sold because it appeared really flat. I like the higher crowns and think that gives the stone more depth. I am wanting a 3 stone emerald cut. If I was able to get my hands on a Amora Krupps for my center what would you suggest for side stones? (Not sure if y’all make smaller stones) for the center I hope to get a 1.5-1.75 ct.
@Angel ,thank you for the compliment, and for so generously sharing what Schbach has said about their cuts. Less has elaborated a lot better about the length to width ratio than I could. It's true that the longer it gets there might be issues of a bow tie effect across the belly of the EC (i.e. light leakage in the center) and the majority of diamonds I have found on blue nile and james allen has been chunky ECs (Skinny good looking ones are not as easy to find). That being said, after viewing them in person, my personal preference is still something around the 1.4 to 1.45 range - chunky ECs look like confused asscher cuts to me, lol. I don't feel that the skinny EC is such a big trade off in terms of optics - it's a matter of balancing optics with the length to width ratio of what you like. What is your personal preference? I am excited for you about the possibilities with Schbach! Are you able to order one and see it in person first? When I was in correspondence with them they told me custom cuts cannot be returned, but they could ship me an existing EC for a few days just for me to see how it performs IRL. I couldn't do it because I was out of the country but that would probably be helpful for you to decide the balance between chunky and skinny. Edit to add: I am glad I am not the only one who noticed the flatness of the F1 EC. The way light travels within the stone was very odd - it goes totally flat, some largish flashes, and flat again. Less @talk-admin , are there any plans to produce skinny ECs? @blushfiend to be honest I do like the more retangular shape emerald cuts. I too think of the chunkier ones as an elongated asscher cur. All step cuts are gorgeous to me but the retangular shape is just my personal preference. Schubach replied back to my pricing questions. I supposed they are pretty fairly priced. 8x5.5 colorless is $840 and the near colorless is $795. BUT they will not sell you just the loose stones which is a bummer to me. I already had a jeweler in mind to make my setting at a much more reasonable price so this is discouraging to me. I have not yet asked about return policy or if viewing the stone before hand is an option. Do you know anything about JYB Jewels off of Etsy? They have a moissanite line called ENV Moissanite. Theirs are cut with windmills and appear to have a higher crown but not sure about the quality besides that. I’ll attach some photos and videos from their Instagram. I read some recommendations for them off of the forums on Weddingbee.Tell me what you think? It is so hard to tell from the photos and videos especially if they aren’t high quality. Not sure if this post is diamond or their moissanite? Hi @Angel ,JYB was actually one of the top contenders (after eliminating all the popular 5 to 6 brands - you probably know who they are) for an EC. Communication with Jules, the owner was great. My only concern was that in the photos and videos, appears to be a few facets showing leakage and also a fair bit of windowing at a tilt angle (there were 2 videos on her insta which showed this but I can't seem to find it) and as you mentioned, the videos are not very clear. If she was able to send an EC for me to view in person prior to ordering, I think it would alleviate my concerns. And I hear you about Schbach's policy about getting the setting from them, which is annoying! Are their settings a lot more than your designer? Would it make sense for you to say order a temp setting from Stuller etc from them instead and get your ring made with your designer? Edit to add: Just saw your question on the last post if the stone is a diamond or moissanite. The quality of the video isn't great but my guess is moiss due to the light return. @blushfiend im waiting for Jules to answer some of my questions now. I’m just so uncertain because the photos and vids aren’t super clear. I’ll update you once I talk more with her. I have another one that I found and am curious about. Called Love Affair Diamonds. I’ll provide you some links below. The stone they have posted is more of an elongated asscher but I believe they will custom cut whatever you want. I sent an inquiry to find out. Tell me what you think! (Read the description. She says there’s no double refraction.) again, I’m not really interested in the shape of this one but if they could do the retangular shape then it could be a good option. those coffin-shaped ones are neat! @Angel , I have worked with Erica (owner of LAD) before, and she's lovely. I hesitate to comment on the EC because an antique EC is different from traditional EC in terms of it's cut and optics, and I don't have enough real world experience with antique EC diamonds. Erica specializes in antique cuts so I am not sure how well can she translate the cut to a modern EC, although it never hurts to ask! That being said, based on one picture it appears the facets are crisp and clear. If she has on hand a traditional EC, I would ask (not just her, but with other potential vendors you have shortlisted) for good, close up videos that shows it in different lighting conditions - daylight, office lighting, spotlighting, and tilt it from side to side to see how it performs, although it might be hard to do. The other one you posted - Port City - you are right - the video lighting is too dark and it's a tad grainy so I can't see much. I went to their instagram and the clearest example of cut I could see was a blue green Eternal branded moiss, and across the center the cut is a little fuzzy for my liking. August Vintage is another one offering moiss ECs recently. I have bought several diamonds from them and Jon's (the owner) obsession with cut results in diamonds that are phenomenal, so by extension I am hoping their moiss cut is going to be good. Their moiss EC is chunky though, and there are no pictures or videos available. Do you have any top contenders in mind? @Dana ♥ , do you mean the antique ECs are the coffin shaped ones? But they have a no return policy on stones since they are custom cut. I have not yet asked about viewing one prior to ordering or if she could send me close photos in diff lighting. She did send me one to show the high crown but it was one I already seen on her instagram. This is the only thing that concerns me if not seeing a real good quality photo or video of her EC. But I am leaning towards JYB as my second option. Love Affair Diamonds actually emailed me back too. This is what she sent me: (I will respond with some more specific questions) I like that you can return the stone! "Yes, I can also order classic emerald cuts as well as asschers! They can be ordered in 8 x 5 for $580, 8 x 6 for $648 and 9 x 6 for $810. I offer a 7-day return period in case you don’t love it (but please allow approx 2 weeks for the stone to be cut and delivered to me)." no, i mean the little ones that seller calls "Calf" cuts. they're, like, tapered baguettes but with a more interesting twist.